The Boycott Party has had a rather strong showing since 1963: of 4.7 Million registered voters, 1.2Million cast blank or invalidated votes, and some 1.3 Million did not bother to turnout to vote at all. 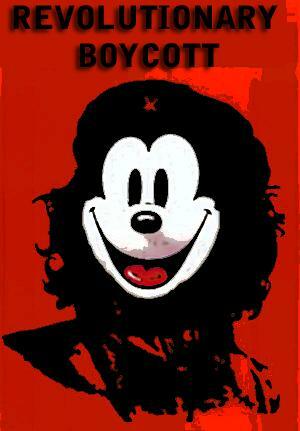 The “Boycott Party” (if indeed it was a boycott) had carried a similar number of votes to that of pro-regime FDIC. When non-cast ballots are accrued, it turns out only one elector out of two bothered to express an interest in UNFP, or Istiqlal or FDIC candidates. If non-voting electors represented a sizeable population, that was taken care of with the next 1977 elections, where turnout climbed as high as 82.36%, which means some 1.1 Million voters did not go to polling stations, and 541,000 others had their votes annulled. 1977 elections observed high turnouts in, say Casablanca (88.75%) and Rabat (83.46%) but equally, their annulled ballots percentage was higher than nationwide mean, respectively 16.93% and 9.49%. An explanation one might venture would be that since ballots in urban areas are easier to check and staff -from opposition parties’ point of view- any perceived risk of ballot-stuffing or tampering with election results in these boroughs is significantly reduced, and even when the mistake is in good faith, chances are it will not be registered properly. Then again, urban areas have had historically high boycott and blank ballot rates throughout: the 1977 and 1963 elections have been retained as specific examples to prove the existence of a strong sense of civics, albeit a particularly deviant one. The talks of referendum or elections these last couple of months are not particularly new: there has always been a significant population that does not trust ballot results, either because it does not trust the political field, or the process itself, or has great doubts over the actual impact on their everyday lives. The “Silent Majority” concept was coined by Richard M. Nixon as a generic word to designate voters fed up with and confused by the deep changes the United States were undergoing at the time (Vietnam War, civil rights, city riots, Hippies, students’ protests…) and adjunct to the sense that somehow, the society was falling apart. Why is it no political party can “rule” by itself? In other terms, how come we always need a coalition (sometimes very heterogeneous) to form a government, even with the Alternance Consensuelle? To begin with, this has marginally little to do with the number of political parties, in fact, a “weak coalition” setting is multifarious, as it ranges from political gerrymandering to ballot system, from weak root activism to the existence of powerful local notabilities, “Moul Chkaras”. And when the administration meddles with elections for some 30 years, nasty tactics do not disappear by themselves. Gerrymandering: Opposition parties have always denounced constituency boundaries because many of those reduce their chances to carry seats. The most recent example is the 2007 Elections, where PJD caucus carried 500,000 votes, some 100,000 more than Istiqlal, but the latter has got 46 seats, some 6 more than PJD. Now, this can mean two things: PJD-led districts have delivered higher majorities, or constituencies where PJD was neck-and-neck with competitors (most famously, the Prime Minister’s district, Larache) boundaries over such and such borough in such and such city can be a deciding factor, since most PJD seats represent urban districts. Gerrymandering, as denounced by many opposition parties over the years, is not the only factor preventing those political organizations -past and present- from what they have considered their right to move into office; indeed, politics of elections in Morocco is hardly a zero-sum game, even though political parties are convinced it is so. While it is true some districts have been allotted with fewer openings for seats, the administrative boundaries do encompass these districts, and administrative provinces have been designed with some other considerations in mind, considerations that rise above petty short-term politics. Security issues, and the need to control rural populations have been more urgent and important to that effect. The traditional dividing line between Useful Morocco vs Useless Morocco was not born out of constituencies’ boundaries. A straightforward illustration of discrepancies between popular votes and caucus size is to compute the number of constituents per carried seats: the lower the ratio, the more favoured a political party was, relative to the carried constituencies: assuming two parties got similar number of votes, one will carry more seats than the other, because the former has a lower electability ratio than the latter. Many of my off-line friends and acquaintances from Rabat or Casablanca showed a great deal of sympathy towards PSU, and would my party have chosen to contest these elections, their votes would have been cast in favour of PSU or Left-Alliance candidates. It’s all very commendable and laudable (from my perspective anyway) but in these specific constituencies, it is very hard, almost impossible to carry more than one seat; first because competition is fierce among ideologically similar parties, the electability ratio is way higher than the national mean, and it requires a lot more than just a few dozen additional votes to make a difference. In that respect, the boycott option spared PSU-AGD candidates the painful and costly ordeal of campaigning in highly competitive districts. In Casablanca, a candidate needs to gather around 63,000 votes to get elected. In Rabat city, the number goes as high as 57,000. 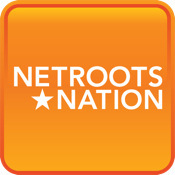 This explains partly why many members of the Left-Alliance leaned in favour of boycotting; for it is a suicide mission to go campaign for votes in large cities; true, there are more seats out there to take (Casablanca and Rabat urban rings gather 48 seats) but it is a costly and hazardous endeavour not every candidate can undertake. 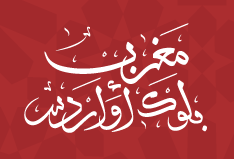 From today till November 25th, I will try to post daily facts about elections in Morocco. This is my own contribution to the ongoing debate, and since my party isn’t going to the country, I suppose I am more at liberty in discussing elections in a more dispassionate fashion. Article 24: Le Roi nomme le premier ministre et les ministres. Il met fin à leurs fonctions, soit à son initiative, soit du fait de leur démission individuelle ou collective. Article 65: Le gouvernement est responsable devant le roi et devant la Chambre des représentants. Article 24: Le Roi nomme le premier ministre et les ministres. Il met fin à leurs fonctions, soit à son initiative, soit du fait de leur démission. Article 59: Le gouvernement est responsable devant le roi et devant la Chambre des représentants. Article 24: Le Roi nomme le premier ministre et les ministres. Il met fin à leurs fonctions, soit à son initiative, soit du fait de leur démission. Article 24: Le Roi nomme le premier ministre. Sur proposition du Premier ministre, Il nomme les autres membres du gouvernement. Il peut mettre fin à leurs fonctions. Il met fin aux fonctions du Gouvernement, soit à son initiative, soit du fait de la démission du Gouvernement. Article 47: Le Roi nomme le Chef du Gouvernement au sein du parti politique arrivé en tête des élections des membres de la Chambre des Représentants, et au vu de leurs résultats. and when it comes to instances, we have had a plethora of Prime Minister ever since 1955: of all 15 Prime Ministers (leading 26 Governments) only seven were partisan politicians, two were monarchs and the rest were technocrats overseeing transitions or standing for day-to-day politics when some major political deal falls short. And until this election, the Prime Minister had very little legitimacy on and from the benches, including both partisan politicians of the so-called Alternance Consensuelle. The assumption behind the position of Prime Minister is that some kind of parliamentary caucus is supporting his job (as yet, no woman has been appointed to the position) as in passing the bills he needs to enact, most importantly the budget bill. Throughout the years, parliamentary majorities were there to keep government business out of trouble, the Censure Motion for instance. As a matter of fact, the constitution as always been very ambiguous on the Bicephalous legitimacy the Prime Minister has had to manage up to now: first from the Monarch, who appoints him to form a government in his name, and by popular vote, and that’s where parliamentary majority comes in, and that is pretty much where comparison with genuine parliamentary monarchies, for it is a well-known fact majorities in the house have always been a tricky business, and is most likely to remain so with the new government, although the horse-trading is theoretically supposed to move from mere petty politics to genuine negotiations to insure workable majorities. Dr Benhima (1967-1969) later on Interior Minister, famously stated: "General Oufkir did not commit suicide"
So Strong-willed Prime Ministers were actually rare: setting aside the Royals, those who actually had enough charisma to stand up and pursue their own political agenda were both Left-leaning PMs, Abdellah Ibrahim (whose tenure came brutally to an end thanks to then-crown Prince My Hassan) and Abderrahmane Youssoufi (although his legacy has followed a crash-and-burn trajectory very early on) That of course, remains my personal assessment, and I would be happy to discuss the fascinating topic of “who was the best Prime Minister Morocco ever had?”. The bottom line is, the Prime Ministerial office has been that of an anonymous underling, with little or no margin for manoeuvre, and sense of initiative was certainly not a prerequisite of the job. Is it likely to change with the next election? I submit it is very unlikely. Next piece might deal with some speculation over the next Prime Minister, but so far, party leaders have all pledged their refusal to express any dissent vis-à-vis the Royal will. And that, I believe is not the present constitution’s fault: we have had over the years, a perverse mechanism, by which competent elements are set aside in favour of Yes-men and obedient characters; Of course, nothing is likely to abruptly change, unless – and there comes the backbone of my own views on constitutional reforms- the constitutional framework allocates important powers to the Head of Government, so as first to stimulate political appetites, trigger competition for the fittest. And because there will be no bail-out, political parties would be forced to cast their incompetent elements in favour of others better prepared for actual government. And to do so also requires a strong parliament, with enough prerogatives to nominate and check on a government upon which they bestow genuine confidence. This statement has no ideological content when it comes to the debt minister Mezouar accumulated throughout his tenure. Or perhaps it does. In any case, Salaheddine Mezouar, a herald of smaller government and other trickle-down economics has failed to live up to his principles: he cut income taxes in 2008 – thus enervating public finances with some MAD 15Bn package gift to the richest households, and yet he obligingly expanded the compensation fund from 25 to 48Bn. He promises the IMF he is going to operate a 10% cut across the budget, but at the same time Makassib trumpets the recruitment of 71,000 civil servants and the increase of minimum wage. Although Central Bank reserves have stood resilient, national debt goes back to early 1990s level, a period of stationary growth. Now, it is to this country’s benefit to have conflicting views and heated debates on how to run an economy, but the constant flip-flopping on behalf of the bland finance minister just look ridiculous; as a matter of fact, his hesitancy and the apparent contradiction in his economic and fiscal policy only show that he cares only about his true constituency, one that has appointed him and to whom he is responsible. Not parliament, nor the electors who got his caucus some 68 seats during the last election. But let us get back to the issue at hand: if not returning to his position, minister Mezouar will leave this country’s public finances in a worse shape than when he took over the finance ministry in 2007: the amount of national debt takes us back to the early 1990s, a time when economic growth barely sustained itself, a time of recession we still are paying for (the low growth observed after ending the structural adjustment program has put a strain on the cumulative wealth per capita, thus leaving us behind other emerging economies) and the taxpayer is likely to be still paying for it: while the efforts to keep the level of overall debt as low as possible are laudable, the package structure, so to speak, does not denote of similar shrewdness in public debt management: the ministry is taking on more debt in smaller instalments, but fail to consider the implication of rising interest rates, thus making borrowings marginally more expensive, but markedly more expensive than they would have been a couple of years ago. 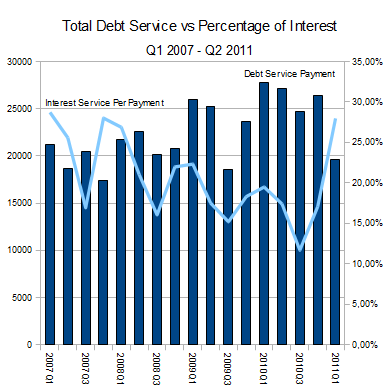 The consequence is, interest paid on debt service has picked up dramatically in less than two quarters from 12% late 2010 to 28% early 2011. The justification for this increasing reliance on debt is obvious: government policy sought to minimize likelihoods of social unrest, thus expanding subsidies on strategic goods. But then again, there is now a sizeable chunk of the public budget debt-funded, in a way that defies all financial orthodoxy the minister and his government said they were set on standing by. 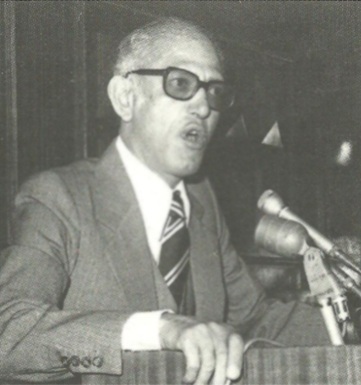 As a matter of fact, it looks as though minister Mezouar yielded to expediency over structural policies, and held forth to the most peripheral items of his politics: a refusal to end tax cuts to top income earners, and at the same time borrow money to keep the compensation fund afloat, both policies which deepen budget deficit and endanger the sustainability of government payroll and investments. Total expenditure reached MAD 293Bn in 2011 for a MAD 54Bn total borrowing; that’s almost a fourth of expenditure financed by borrowings, where taxes would have done better. The claim here is taxpayers are better off paying stable taxes every year, instead of shouldering the interest on government debt. After all, every one of the 6.65 million households has, on average an outstanding debt of MAD 55,000 and annual instalments of MAD 3,650 including some 860 dirhams of debt. Incidentally, HCP standards considers the median monthly income of MAD 5308 to be a good indicator of Middle Class, and their income roughly equates the weight of debt on their finances, while they have to sustain a 6% annual drain on their gross income. That’s 3 basis points above Bank Al Maghrib main interest rates, 2 basis points above GDP growth and more alarmingly, more than 5 points above GNI growth in 2010. What does it tell about the government’s boasting it has improved standards of living, when its own fiscal and debt policy saddles households with an expensive debt? This is not a question of debt sustainability in terms of volume (after all, the MAD 55,000 stock debt has to be equated with households’ assets instead of annual income) but rather the cost at which this debt is bought, and the strain it puts on individuals’ finances. National debt means every taxpayer is a collateral to the debt, commensurate to their income and wealth. But, taxation in Morocco is not equitable, nor is it progressive, especially since 2008 with the scrapping of the 42% marginal rate. To 50% of all households, debt on average 11% of their annual gross income, while for the top 10%, it represents less than 2% of their annual income. Again, debt stock and debt service puts a great deal of strain on the finances of the huge majority of Moroccan households: according to their income distribution, the bottom 10% contribution would pay for MAD 6Bn of service debt, while the top 10% contribute only MAD 500 Million. That means a household with an annual income of 21,800 dirhams would pays 9 times more than a household earning 186,000 per annum. On a more macroeconomic tone, the level of stock debt is alarmingly going high, especially when compared to gross capital formation: sound economic policy suggests to compare total accumulated assets to the stock of debt (foreign and domestic) because it gives a good indicator on whether debt is managed properly. The evidence so far suggests otherwise: over the last two decades, the leverage ratio of total debt over domestic assets has gone down from 4:1 to 2:1. But, in the last two years, climbed 17% and basically wipe out any gains obtained between 2006 and 2010.
a bump of a dozen of bps in less than one year over specific terms is not good news. 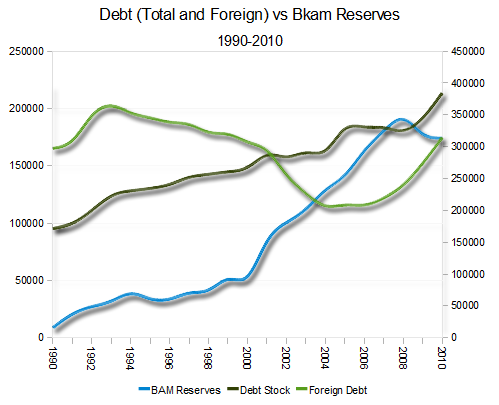 The situation isn’t as black as I made out; first because growth is in line with the last 5 years-trend, foreign reserves are not in disarray (and as a matter of fact, we are doing pretty fine with MAD 173.3 Bn of foreign reserves) and debt-to-GDP ratio is at it lowest, certainly much lower than observed figures in the 1980s and early 1990s. But, and this are the early-warning signs of a pending debt crisis (with its cortège of budget cuts, austerity and social unrest) the interest paid on debt is increasing. 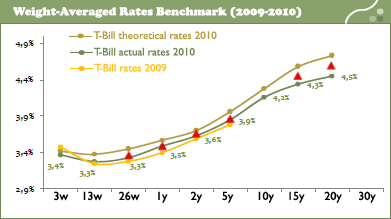 The gross yield on domestic borrowings has gone up between 2009 and 2010 from 5.10% to 5.25% real yield on 5years treasury bills. Indeed, over longer terms, yield has increased from 2009 and 2010. No significant increases of course, but when considered over the course of only one year, and when these are most important on intermediate and medium terms, this means some policy is needed to address the frantic borrowings, and instead look for revenue enhancement. 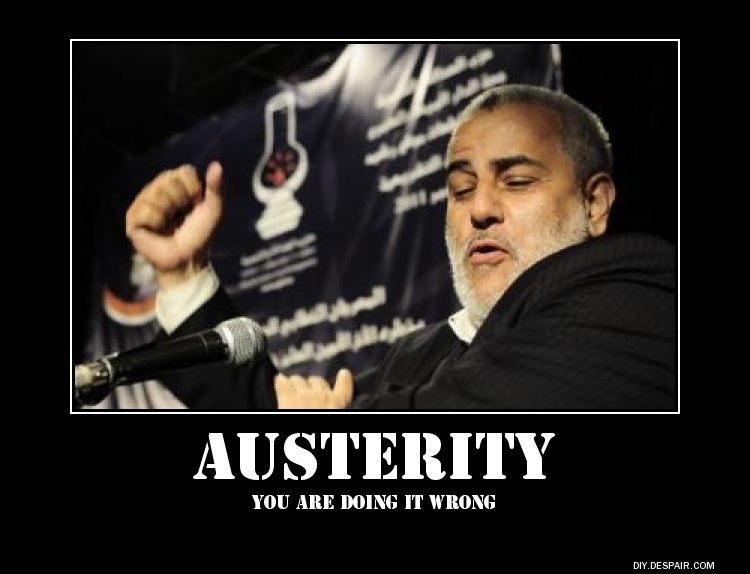 But then again, this is not minister Mezouar’s creed, he doesn’t believe wealthier individuals should contribute more in times of financial dire straits, or at least close up the obscene loopholes they directly benefit from, up to MAD 7.9Bn in the 2011 budget, that is more than a quarter of all tax cuts as priced in the budget law. So far, the trickle down economics doesn’t serve our government well. La Vie Eco published an interesting projection on the future post-25 November election. More of a speculation really: in the absence of computed swing votes for each party over all opened seats for parliament house, predictions over which party will lead the coalition are meaningless, though they can shed some interesting lights on the future coalition government. It is safe to say that there are two given in Moroccan politics: first, no political party can pretend to form a government on their own, meaning, no single political party can gather absolute majority – half seats plus one- in both houses, and second, coalitions need not to be homogeneous to work together for a full term. USFP and Istiqlal did manage to work with political parties it has long identified as ideological adversaries and rivals, parties like MP or RNI for instance. 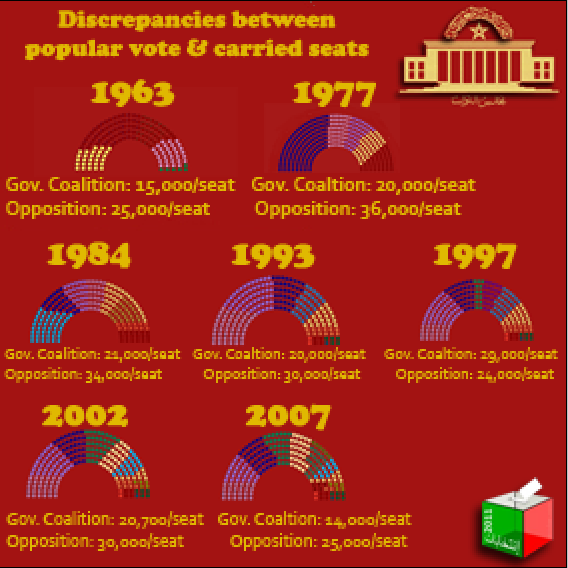 Since 1993, major political parties have failed to grasp majorities with large margins, meaning that as time goes by, majority coalition has increased the number of necessary parties to secure a government. Political problems also increased in forming such a majorities: junior partners need to be contented just as large ones, and opposition parties -those left out of negotiations- need to be isolated, and the negative effect of their size in parliament is blocked away. And so, speculation goes over which party will emerge as the winner, and the subsequent coalition built around the new leader of the house. And yet, the same parties keep popping up as candidates for coalition members, even the issue of “leader party” is meaningless, save perhaps for the “President of Government” new trophy position: is it going to be Mezouar? Biadillah? Benkirane? or one of the respective successors of El Fassi or Radi? It goes without saying that ballot system will condition the Premiership allocation to one party over the other, but would have little effect on the coalition itself. 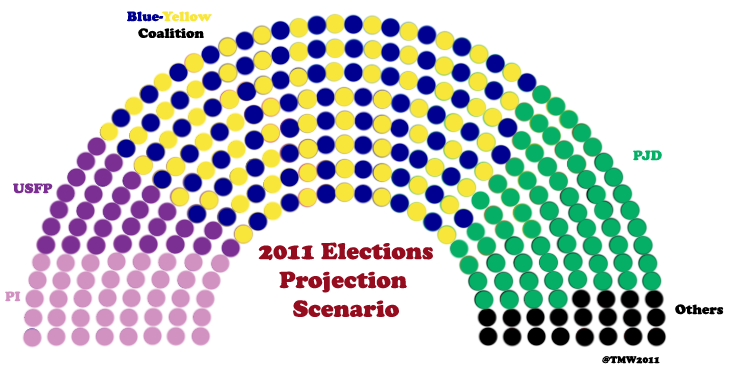 So 2011 might very well turn out to be not only predictable as for the majority coalition, but the number of seats can be predicted as well. So far, parliamentary caucuses of MP (Mouvement Populaire), RCU (Rassemblement Constitutionnel Unifié – RNI and UC Joint-venture) and PAM make up for 150 out of 325, they are favoured as a winning coalition, especially when the outgoing government coalition gathers the support of 140 seats, with all the drawbacks of a motley composition made up of Koutla members and “Administrative Parties”. 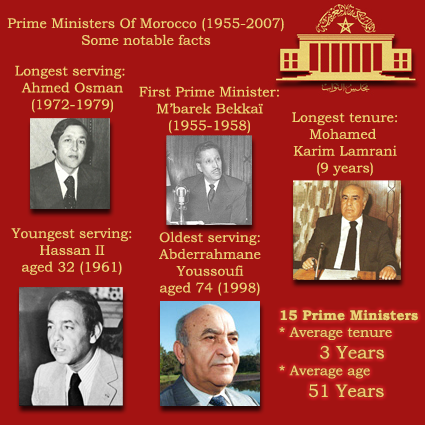 Now, gaming majorities in Moroccan politics has been increasingly difficult ever since 1997. First off because administrative meddling with election abated since then, as ballot-stuffing, gerrymandering and other nasty tactics progressively -but not entirely- gave way to a certain degree of freedom and fairness during the campaigns, which does not mean corruption and frequent incidents did not occur over the last 15 years. All in all, these parties that have been kept out in opposition for many years turned out to be quite harmless when they finally came in office, and instead did not challenge the establishment they were so keen on denouncing when they were out, in the wilderness. Second, turnout started to drop markedly starting from 1997: elections prior the Alternance Consensuelle observed a 58.3% turnout, which have been decreasing ever since: 51.6% in 2002 and finally 37.3% in 2007. The result of the decreasing turnout accrued to that a fragmented political play-field, as 5 major parties are needed to carry an absolute majority. In 1997, 4 parties could have insured that majority. The subsequent splits and spin-offs, as well as the exercise of power have weakened parties, while others stepped in the limelight and quickly became political forces to be reckoned with. Let us now turn to some predictions on the November 2011 Elections: since the new legislation has not yet been processed to this day, we still consider the 295 districts -and their existing boundaries- plus the 30 seats allocated to women as the basis of coalition gaming. The great thing about 2007 elections is paradoxically its low turnout; those districts with the highest abstention rates were precisely the ones carried by PJD vote. Other than that, constituencies East and South the Atlas Mountains have registered relatively high turnout, an average of 57%. On those seats, incumbents are not easily unseated, especially when it comes to challengers like PJD in rural areas and hinterlands. On the other hand, the same party has pretty good chances to carries a majority of seats in Casablanca, Larache, Khouribga and Rabat, but would not, unless exceptional circumstances decide otherwise, carry more than 60 seats, most of which are located in the constituencies mentioned above. Because PJD would be returning with a larger caucus, USFP and Istiqlal will bear the loss of transferred votes: let us remember that in 2002, Istiqlal Leader Abbas El Fassi carried 15,823 votes, while PJD candidates carried 15,125. In 2007, the same party leader, soon to be a Prime Minister was 2 points behind PJD candidates, a sure sign of weakness, considering the strong electoral base Istiqlal party enjoyed for many years. USFP presence in Casablanca has also been very symbolic, considering the extremely low turnout (less than 2% of the votes across the Grand Casablanca) and might very well be ousted in the next elections. Both Koutla partners will be competing for Sahrawi seats, since both USFP and Istiqlal carried around 25% of votes in all constituencies, though because of their strong foothold there, PAM candidates could prove to be serious challengers. All in all, and because PJD gains would be at the expenses of Koutla members, their combined caucus would not go beyond 60-70 seats. This means USFP loses its remaining Rabat and Casablanca-Anfa seats, and partially make up the loss in Agadir hinterlands, while Istiqlal concedes Mediouna and Hay Hassani. Because their constituencies are relatively concentrated in similar provinces, RNI, UC and MP can claim to improve their majorities; as far as MP performance goes, Rabat hinterland is now locked-in, with good chances for another seat at Rabat itself. As for RNI-UC, and since they have taken up their electoral alliance a step further, it is not inconceivable to imagine a “Blue-Yellow” coalition, with Blue RNI-UC-PAM making a run for urban and rural districts, while MP carries its traditional constituency in mountainous regions. Indeed, PAM votes deliver the Atlantic coast, Marrakesh and its rural outskirts, with some 25 to 30 seats, although such computations assume commensurable results to the carried votes by previously independent representatives, or candidates from the smaller parties than joined and merged in before 2009. The RNI-UC caucus could gain a dozen of seats in some cities like Casablanca, Kenitra, or rural districts like Sidi Kacem or in the Eastern districts. All in all, the Blue-Yellow coalition could muster 160-170 seats pretty easily, thus insuring a stable and large majority in parliament house. These numbers are not pulled out of a hat, obviously. We consider 128 seats in 24 provinces either because of the important number of carried districts, or the high number of young, less than 30-years old voters. In Casablanca and Rabat, young voters make up respectively about 816,000 and 216,000. That’s more than all turnout voters in 2007, and certainly more than what one party could have gathered. Indeed, Istiqlal and PJD representatives at best, gathered 160,000 votes in Casablanca in 2007, which makes less than 14% of total electoral votes. A larger turnout, in the region of 40-60% could change completely the electoral map in the Grand Casablanca, as well as major urban agglomerations across Morocco. 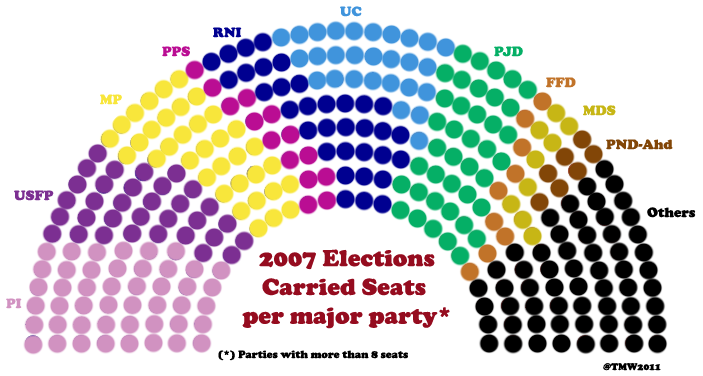 it becomes apparent that out of these 128 seats, 90 can be delivered with large landslides, were the youth vote turnout to be in line with a nationwide rate (estimated at 58-60%), some 4.5 Million young voters are indeed going to determine both locally and in parliament, the shape of coalition majority and opposition. Now, it has been observed that turnout in legislative elections following constitutional referendums has been on average, higher than those of ‘regular’ elections, by some 18 points-odd margin. And so, an expected turnout of 60% could mean genuine majorities for representatives in terms of popular vote, and not a pyrrhic victory for the last man standing. Furthermore, the table above shows how a candidate can seize a seat with the help of the youth vote. It is not unreasonable an assumption that, since young voter have had in the past a stable, low turnout in general elections, they would participate enthusiastically in large numbers, provided candidates appeal to them and manage to elicit their support. That’s the ball game: The previous projection is a conservative estimate of what might happen with reasonable prediction over long-term pattern votes. But then again, there are 90 seats around easy to fill with youth vote, for any coalition party ready and willing to do what it takes to get young Moroccans registered and down to polling stations. Other seats can be equally carried with a majority of young voters too.